Missouri Gov. 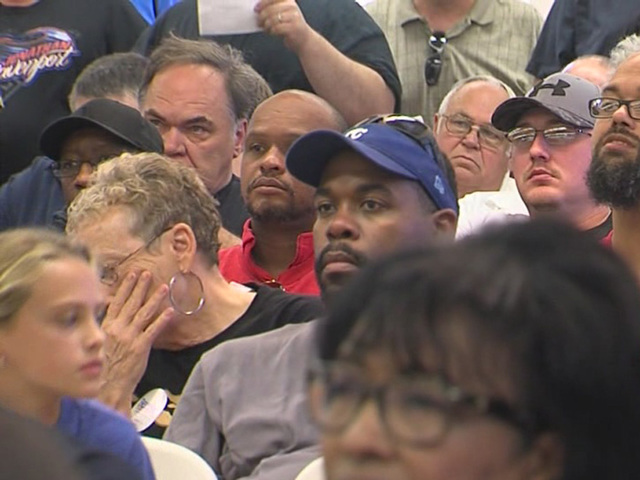 Jay Nixon and Teamsters General President James P. Hoffa were among those in attendance Saturday at a rally to defeat a proposed right-to-work bill in Missouri. Nixon and Hoffa joined hundreds of union employees in Kansas City, Mo., at the rally. The Missouri House of Representatives and Missouri Senate passed right-to-work, but the governor vetoed the bill. "It's my expectation that next week, they are not going to override my veto," Nixon said. "That's not only because what we are saying here, but it's because of these people and their neighbors all across the state. These legislators, Democrats and Republicans, are voting with us because they are reflecting the will of the people." The bill would prohibit workplace contracts that require union fees to be collected from nonmembers. - No person is required to become a member of a labor union. This includes paying any dues, fees, assessments or any other financial related item in connection to the union. - Violators would face misdemeanor charges. The punishment could be 15 days in jail and a $300 fee. - The prosecutor in each county and attorney general would investigate all complaints, threats or violations of the law. Hoffa said Missouri is a key battleground for the labor movement. "Missouri is where it's at right now, because this is the battle ground on right-to-work," Hoffa said. Supporters say the bill would be good for business and encourage businesses to move to the state. Not enough Missouri lawmakers appear to support a contentious right-to-work measure to overturn Democratic Gov. Jay Nixon's veto of the bill, an Associated Press analysis shows. Interviews with lawmakers indicate House Republicans in favor of right to work are short of the needed two-thirds majority required to overturn Nixon's veto heading into Wednesday's legislative session. At least nine of the 23 Republican House members who voted against the legislation in May told AP they plan to support Nixon's veto if the proposal is brought up for an override vote, and another has publicly said she still opposes right to work. The measure was one of the most hotly debated in the legislative session that ended in May, spurring union rallies at the Capitol and a Senate shutdown when Democrats filibustered for days after some Republicans forced a vote that led to the bill's passage. Supporters say the legislation would attract more businesses to the state and spur economic growth, while opponents assert it would undermine unions and lead to lower wages. Reviews of research into the economic effects of right-to-work laws generally conclude it is difficult to isolate the impact of those provisions compared to other state policies in place. Proponents of the measure also say workers should not be forced to pay fees for representation if they don't want to be members of the union. But GOP backers will face a challenge in overriding Nixon's veto; they need 109 votes in the House, but the measure originally passed by a 92-66 vote. It passed the Senate in a 21-13 vote, which would be two votes short of the required two-thirds majority for an override. Because the bill originated in the House, a veto override attempt also must start there. Republican Reps. Kevin Engler of Farmington, Paul Fitzwater of Potosi, Elaine Gannon of De Soto, Galen Higdon of St. Joseph, Nick King of Liberty, Jeanie Lauer of Blue Springs, Jim Neely of Cameron, Shane Roden of Cedar Hill and Anne Zerr of St. Charles all told AP they would vote against right to work during a veto override session. A message posted on the Facebook page for Rep. Linda Black, R-Park Hills, quoted her as saying she would continue to oppose right to work. An aide to Black confirmed to the AP that the lawmaker is against the legislation. "I campaigned that I was going to be against it," Roden said, adding that he has received a flood of phone calls from constituents opposed to right to work. "I'm not going to go back on my word." The remaining GOP lawmakers in the House who voted against the bill did not return AP requests for comment, said they were still deciding or declined to disclose how they might vote. But even if all of the remaining 13 Republican lawmakers who previously voted against the bill switched, it still would fail with just 106 votes in its favor. That's assuming all Republicans who previously voted for the measure stick with their original vote and all Democrats vote against it. There's still time for Republican House leaders to persuade members to vote in favor of making Missouri the 26th right-to-work state, and the margins are close enough that a few lawmakers could tip the scales. Roden said lawmakers from Michigan, which became a right-to-work state in 2012 after a push by the GOP-led Legislature, have met with him. The Missouri branch of the conservative Americans for Prosperity group plans to rally Wednesday at the Capitol. They're working against groups such as political action committee Protect Missouri Families, which is contacting lawmakers and encouraging union members and other opponents to call their representatives. It spent roughly $113,000 between April and the end of June to fight right to work, about $55,500 on public relations and roughly $35,000 for T-shirts. 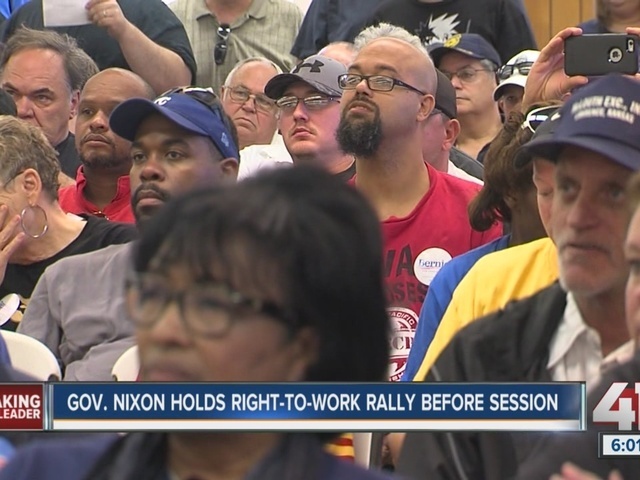 Nixon, the president of the Teamsters union and local union members were to meet Saturday at a Kansas City Teamsters hall to thank opponents of the measure. House Republican Majority Leader Rep. Mike Cierpiot said Tuesday that leaders still had not decided whether to bring right to work up for a vote, but that it was "probably the weakest" bill up for an override. "We're still working on it," Cierpiot said. "We really won't know where we are until we get close next week." Right-to-work bill is HB 116. Follow Summer Ballentine at https://www.twitter.com/esballentine .